There’s something so comforting and so terrifying about family. 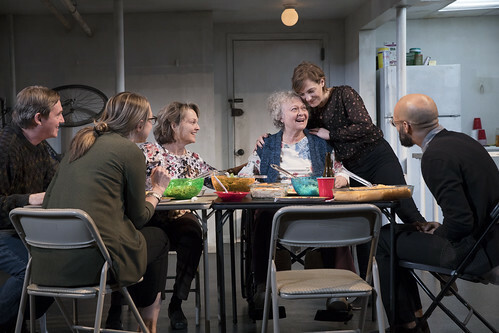 That dichotomy is captured perfectly in Stephen Karam’s The Humans, the Tony Award-winning drama that is now touring the country. The superb production is at the Orpheum Theatre as part of the SHN season. It’s a rare enough occurrence these days for a play to go on tour, but to have one this entertaining and unsettling is even more reason for celebration (side note: there are almost four times as many producers listed as actors). Karam’s play does something extraordinary by trying to be ultra-ordinary. Working with director Joe Mantello and six finely attuned actors, he is able to replicate reality all the while amplifying it, magnifying it, loving it and revealing its fissures and its darkest, scariest spots. The play happens on multiple levels – literally and figuratively. The set by David Zinn creates a cutaway look into a dingy two-story apartment in New York’s Chinatown. The first floor is on ground level, the second is underneath in the basement, and the lightless windows look out on a dirty alley (not the “interior courtyard” described by the real estate agents). It’s the new home for young couple Brigid (Daisy Eagan) and Richard (Luis Vega), and though they haven’t received their furniture yet from the moving company in Queens, they’re still enthusiastically hosting Brigid’s family for Thanksgiving dinner. So on those two levels and over the course of about 90 minutes, we watch a family come together for a holiday. Mom and Dad – Erik (Richard Thomas) and Deirdre (Pamela Reed) – have driven in from Scranton, Pa., along with Erik’s mom, “Momo” (Lauren Klein, reprising her role from the Broadway production), who, in the throes of dementia-induced oblivion, is having a bad day as she is wheeled around in her chair. Brigid’s sister, Aimee (Therese Plaehn), is also there, trying to be cheerful in spite of a broken heart (her longtime girlfriend has split) and an increasingly serious illness. Everybody’s got their baggage here. It’s individual and it’s collective. There are valiant attempts to keep things light and festive and loving, but that baggage is heavy, and it unloads fear and anxiety at every given opportunity. The contrasting dark and light couldn’t be more pronounced in the physical production, with the split-level set often bright in one half and murky dark in the other (lighting design by Justin Townsend). This is a reasonably happy family – they really do love one another – and yet…what’s so scary about this show (and it does sometimes feel like a horror show) is that love can’t keep the encroaching terror at bay. These people are dealing with a hostile world, hostile to their middle-class ways and modest ambitions. As if the illness, employment woes and relationship stress weren’t enough, they also have to contend with the fact that two of their number nearly perished in the 9/11 attack on the World Trade Center. Their woes are internal, familial, national and international. The fact that they can muster any cheer at all as they dine off paper plates and drink champagne out of plastic cups is astonishing. As with any functioning family (we used to call families dysfunctional way too much, but that still seems like a form of functioning), the jagged edges of hostility and truth occasionally cut through the civility and affection. Each time that happens, it’s harder to regain equilibrium. But someone usually manages, and that someone is most often Richard (a charming Vega), who is still getting to know his girlfriend’s family. Everyone else is too immersed in their problems to remain fully buoyant. The most unstable is the patriarch, Erik (beautifully, poignantly played by Thomas). He’s got physical back pain, he has gone through major work trauma, he’s barely affording medical costs for his mother, he survived a terrorist attack and he is suffering the ramifications of a terrible life decision. It’s no wonder that the anxiety attack the audience is allowed most deeply into is his – and we’re in to the point of practically seeing the monsters that haunt his dreams. As Deidre, Reed is a marvel in the way she creates such a complex, believable woman who relies on her faith to keep her going. Her burdens have been fierce – among others, her decades-long job has her paid less than the 20somethings who are now her bosses. She perceives and processes a lot more than most around her would credit, but she is stalwart. She is taking strength where she can, marching forward on her arthritic knees, one painful step at a time. The daughters demonstrate interesting differences in maturity. Plaehn’s Aimee is worn down by illness, heartbreak and job loss, but she’s a grown-up. You can see a lot of her mother in Aimee just as you can see Erik in Eagan’s Brigid, who’s trafficking in cockiness and insecurity to levels that are as annoying as they are endearing. And Klein as Momo offers some of the evening’s most chilling and affecting moments by doing so much with so little. The Humans is an incredibly understated play. It doesn’t offer the screaming family drama of, say, an August, Osage County. Nor is it after reassuring “love conquers all” platitudes. No, this is a family drama for our dark, troubled, defeating times. Love and family, so often the solid center, somehow don’t seem to generate enough light for this particular darkness. And that, is terrifying. 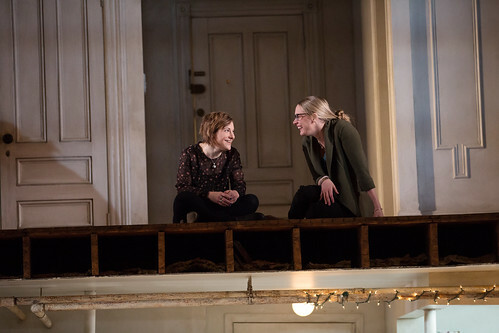 Stephen Karam’s The Humans continues through June 17 at the Orpheum Theatre, 1192 Market St., San Francisco. Tickets are $40-$150. Call 888-746-1799 or visit www.shnsf.com.